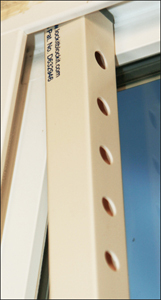 The Lock-it Block-it has 13 holes for various height adjustment options. 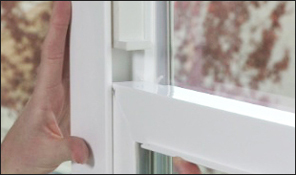 Adjust how high you want your window to open by choosing the hole you want to use. Note, for childproofing, 4 inch max opening is recommended. 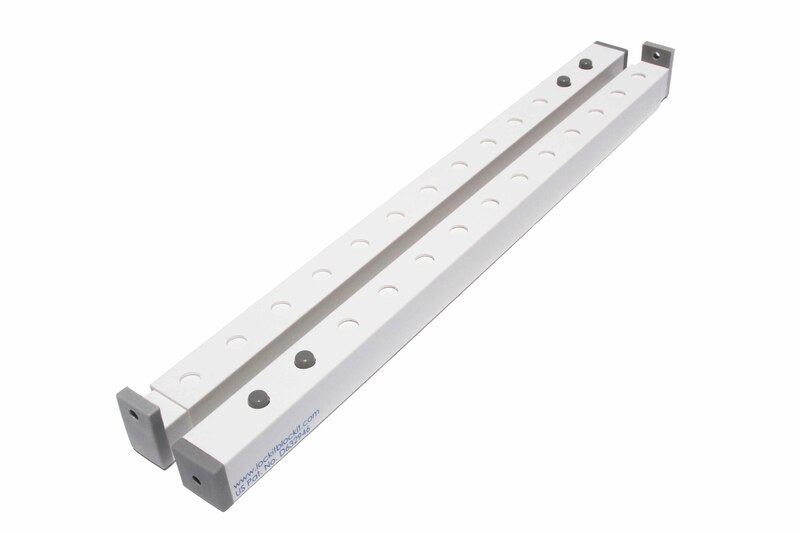 For burglar proofing, 6 inch max opening is recommended. The Velcro will go on the side which you don't want to use. Peel the off the plastic from one side of the Velcro strip. Attach one strip near the head of the Lock-it Block-it of the outer cylinder (with the holes). Attach the other strip near the bottom of the outer cylinder. Attach the remaining strips to the outer cylinder. All three Velcro strips need to be attached. Don't pull apart the Velcro. Attach the strip as they come in the box - stuck together. 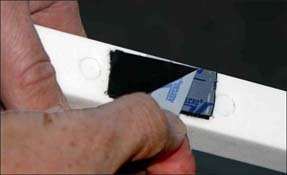 Peel off the remaining plastic from the back of all three strips. Remember, you can buy more Velcro from your favorite store if you want added adhesive strength. For the best performance, purchase industrial-strength Velcro from your local store. Very Important - Wedge the head of the Lock-it Block-it into the top corner of the window. 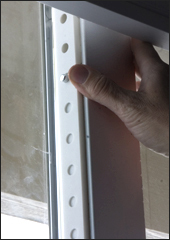 The head of the device must be firmly butted up against the top of the window frame so that it can't be move. If it isn't, the Lock-it Block-it will fail to work properly and your safety will be compromised. Press the Lock-it Block-it firmly into the track (or against the sash). Remember to periodically check to make sure the Velcro is working properly and that the Lock-it Block-it hasn't come loose or slipped slightly. If you feel it has become loose, simply press it in again. If it has slipped slightly downward, replace the Velcro. We do not guarantee the effectiveness of the Velcro or other attaching mechanism. Press in the push-pin and slide the inner cylinder to the desired position. To block children from falling out, make sure your window isn't opened more than 4 inches. 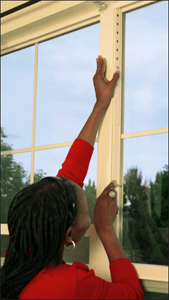 To block criminals from getting in, make sure your window isn't opened more than 5 to 6 inches. When the push-pin clicks into the hole you want, then the Lock-it Block-it is locked and ready to use. Don't remove the device from the window to make adjustments. Simply press in the push pin, slide the inner cylinder to the height you want and it clicks into place. Your window is locked open at that height. When the window meets the Lock-it Block-it, it can't be opened beyond that point. Wait at least 8 hours before trying to remove the Lock-it Block-it from the window. This will allow the adhesive to set properly. It's important to check each device periodically throughout the year to make sure it continues to adhere to the surface properly. 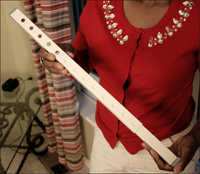 If you have windows smaller than 3.5 feet, use a fine-tooth saw to cut the length of both the outer and inner cylinders. The device cuts nicely.